Quand on prie la bonne étoile, La Fée bleu secoue son voile, anything thing your heart desires will come to you. 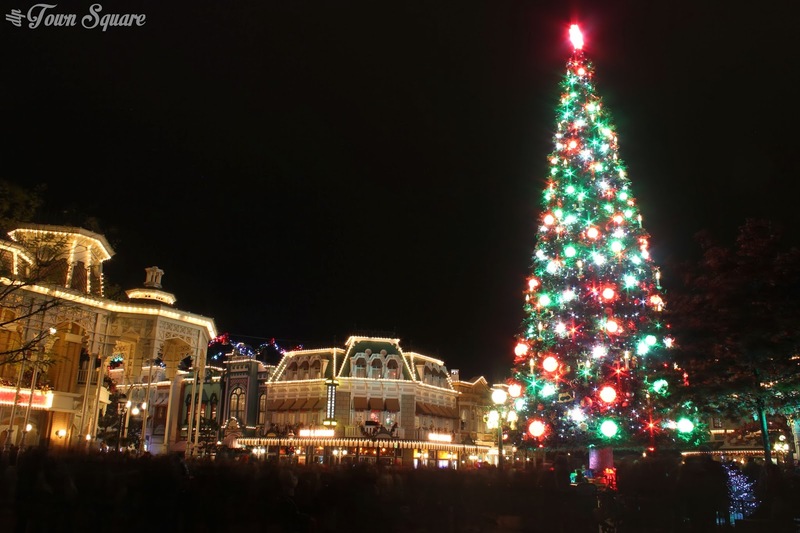 One of the highlights of this years festive offering at Disneyland Paris is the Magical Christmas Wishes show which is performed twice per night in Town Square in Disneyland Park. Let’s take a step back and set up the scene, night has fallen on Main Street USA; the magical new Christmas tree with its many colours has been plunged into darkness. As crowds gather in and around Town Square, something magic is about to happen. The lights turn off, the entire street is put into darkness, but we soon begin to find the lights on the tree and meet our master of ceremony Jiminy Cricket and Pinocchio, as we learn about the power of wishes, the tree becomes a screen on multicoloured lights in a changing formation. The whole show is technically brilliant, but you don’t need me to tell you that, rather I’d prefer you to experience it for yourself, either in person or via our YouTube video. What is particularly strong about this show is the many different colours and effects that have been used, it is impossible to not get that tingling sensation down your spine when that final reprise of ‘O Christmas Tree’ comes over the speakers as the mesmerizing effect of the tree takes effect on the guests who have gathered to watch the spectacle. 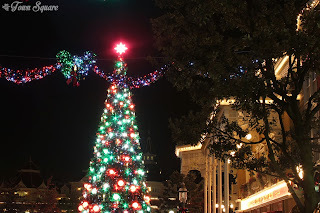 As a package, the show has evolved totally from what was experienced in recent years, which mostly involved singing characters and a child lighting up the tree (which was a nice touch). Whilst this made a nice show, there was one element that was against it, and that was it’s one-dimensional nature (from a viewing perspective). This show allows guests to experience it from multiple angles, 360 degrees to be precise; not having characters or a ‘focal point’ (That isn’t a tree) means that the spherical nature of the tree can properly be exploited to magical effect. The experience changes from place to place, see it in Town Square, and you’ll certainly see the tree (no child on shoulders needed!) and you might even see the garlands too. Stand mid-way down Main Street and the show will feel even more like a 360 degree show as the garlands join in on the act further into the show, the colour changing to reflect the show really is a perfect touch. As a viewer, things don’t get better than this show, as a technical fan this show is a real marvel. To see the baubles and stars light up in synchronisation is nothing short of a marvel. This show will continue to marvel audiences for as long as it runs, and lets hope that it does for a very long time. Disney’s Enchanted Christmas runs from the 10th November 2013 until the 6th January 2014. Magical Christmas Wishes is performed twice daily during this time, consult your daily program for more information, including show times.